I’m writing this, sitting on a Virgin East Coast train as we whip down from Edinburgh to London on our whistle-stop visit to the UK. This is a week of catching up with family and friends, and it seems strange being reminded that we are in a brand new Year, as New Year’s Eve already seems like a dim and distant memory. So, how did we spend our New Year in Spain? Last year, if you have followed our blog religiously, you may remember we found ourselves as the only diners in one of our favourite restaurants, El Puente on the edge of Dúrcal, having a fabulous meal with the children. This year was very different, primarily as we didn’t have any visitors, and in the event I found this disconcerting and have decided that I really do miss family at this time of the year. 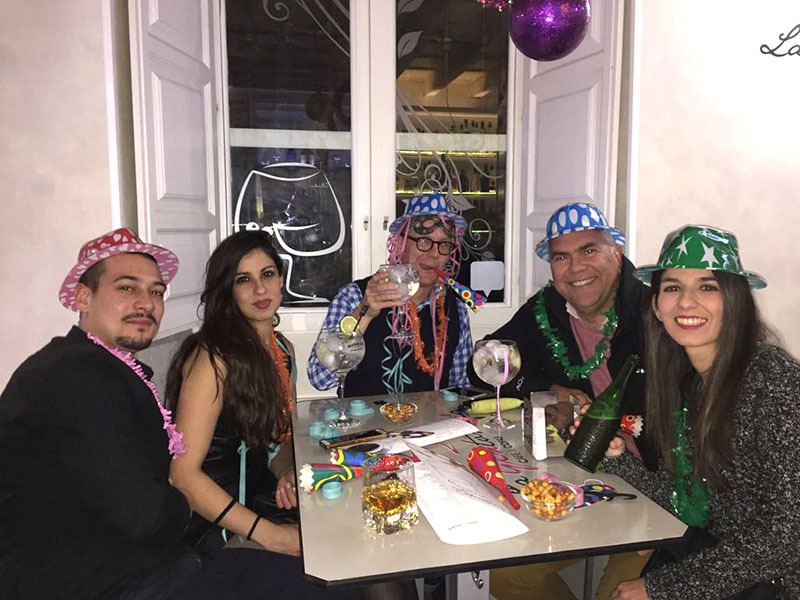 For New Year’s Eve, we were invited to dinner and to stay the night with a friend in the centre of Granada. Maria was one of our teachers at our Spanish language school and her boyfriend, Yannik, is a German chef. They have an apartment off La Puerta Real in the heart of Granada, and we were quite looking forward to seeing what New Year’s Eve would be like in the city. We had heard, last year, that it is no big deal, and the bars tend to be closed, restaurants fully booked and very little else to see. That said, people do tend to assemble in Plaza del Carmen outside the Ayuntamiento as the bells chime Midnight, and the customary twelve grapes are scoffed. We had a lovely dinner with Maria and Yannik, along with a friend of Maria’s, although it is at times of such celebration that you are reminded how scant is one’s knowledge of conversational Spanish. As ever, New Year’s Resolution is to just get better at speaking Spanish! Andrew and I were very keen to nip out before midnight just to see what went on in the City centre, given that this was our first experience of seeing in a New Year in Granada. Maria seemed more keen to watch the Madrid celebrations on the TV, as the outside temperature was not massively tempting, but our insistence prevailed, and we set off for the Plaza del Carmen. Crowds of people were already in the street, so we couldn’t quite work our way through to the square itself, but that didn’t really matter; we were looking for the atmosphere. We were armed with our little bags containing 12 grapes, and we didn’t have to wait too long before the bells started to ring. Champagne corks popped, and with every chime of the bell, a grape was bolted down. This was a hugely good-natured gathering, and showers of champagne mattered not a jot as we looked up at the fireworks overhead. I remembered, some years ago, seeing the magnificent fireworks on the banks of the River Thames in London, from a great vantage point below Charing Cross Station. The fireworks were stunning, but the 3 hour walk, in huge crowds of people, to get up to Blackfriars Bridge and then back to our car park at the Royal National Theatre rather took the edge off the jollity and spectacle of the main event. In Granada, we saw in 2018 then went off in search of a bar. I mentioned earlier that bars tend to be closed on New Year’s Eve, and they are until after midnight. Once that hour arrives, then many of the clubs and cocktail bars will open until the very small hours. I do wonder if I will ever get used to nocturnal partying. We managed to stay out until about 3am before admitting defeat, and Maria and Yannik walked us back to the apartment to let us in. They then decided to go out again! The night was still young….I couldn’t have imagined anything worse. Yannik optimistically suggested that he would be up to cook a breakfast of scrambled eggs and whatever we might fancy, and with that they were gone. I can’t remember having drunk that much, but when I woke up later that morning, I really didn’t feel that hot. There was no sign of Yannik and Maria, and I had no real idea what time they returned. We decided we’d set off and get some breakfast on the way home, so did a slight walk of shame into the watery early morning sunlight of that first day of January. Coffee and a croissant were difficult to face, but after a sleep at home, I recovered fairly swiftly. I think it is the late night, rather then the consumption of alcohol that finishes me off, but hardly the most auspicious start to a New Year. Andrew and I, therefore, spent the rest of that day in a rather gentle fashion. To us, Christmas frivolities end on New Year’s Day and normally, in the UK, the realisation sets in that a return to work is imminent. Of course, In Spain, the main festive event is yet to come, as el Dia de Los Reyes Magos is that time when everyone gets together to receive gifts and have yet another slap-up family meal. The village this year kept us in suspense. 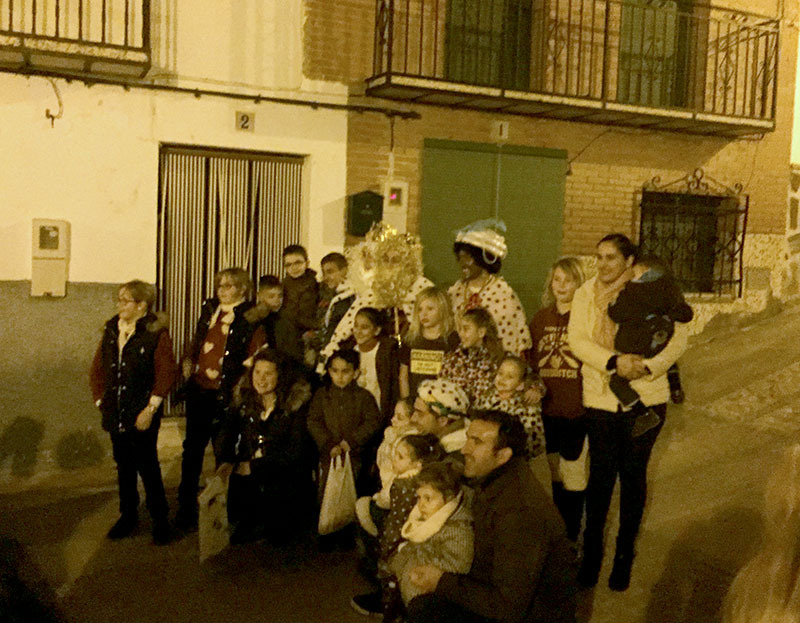 We remembered from last year that the Three Kings normally arrive in the village at around 7.30pm, so at just after 7pm we set out to see what was happening. There was no sign of life! Last year, some of the village children had been waiting expectantly in the square below Casa Magdalena, and there was a sense of anticipation. This year, there was silence. We wandered to the bar - the door was closed, and only one or two doughty locals sat inside, and we weren’t quite in the mood for convivial exchanges within. We went back home and poured a gin. Suddenly, there was a hubbub outside, and the Three Kings had arrived, raining sweets through the gateway as they passed. Visi and Clemente, our lovely neighbours, were already there, gathering up the treats and so we joined in. As before, the Three Kings were borne along in a trailer attached to a four-stroke (or is it two-stroke?) agricultural cultivator, and they wobbled precariously through the tiny streets to the village square where they alighted to be photographed with the village children. In the cities, this Cabalgata, or procession, is a much larger affair, but there is something lovely and homegrown about this Saleres celebration. From nowhere, the villagers had appeared and occupied the square as children scampered about collecting sweets and waiting for their presents. The tradition is that presents are delivered to a central location in the village and then everyone will gather round to see the grand opening. I am not sure if I’d fancy this as a child, being on display to all and sundry when opening my gifts, particularly if Santa Claus didn’t actually bring me what I had asked for explicitly (I was such a spoilt child!). Andrew and I opted for the bar at this stage whilst most of the other villagers trooped upstairs to see what the Three Kings had brought. We gather, from feedback, that there was a great deal of excited noise, as we well as some tears. I think Andrew and I might have been in that latter camp. So, that was it. Christmas officially over for another year. The 6th January is a national holiday, and the opportunity for another family gathering involving food. In Granada it snowed, heavily. All around our little corner of the valley, the snow fell thickly, and we felt slightly cheated as we saw numerous social media posts showing lying snow, falling snow, white hillsides and frosted trees. We got in the car and drove to our new house in Moclín feeling fairly confident that, at 1,000 metres altitude, it would be a winter wonderland. The countryside surrounding Granada was white, and magical; we love the snow and to see this incredible landscape in such an alien state was well worth the drive. We arrived in Moclín to see the Three Kings emerging from the bar in the main square and walking, not necessarily in a straight line, along one of the village lanes. Our little house, on Calle Amargura, had a dusting of snow, and low cloud swirled in the valley. From the snowy garden, we couldn’t see the Sierra Nevada for cloud, but we had our own little Christmassy scene. It was cold, and the forecast indicates that the cold weather in Spain is set to continue for a while longer, so arriving in Scotland for our New Year family visit didn’t hold any shocks. The similarity between a decidedly chilly and grey Perthshire didn’t seem that far removed from the chilly Granada we had left behind. So, the train hurtles southwards, and we spend the next few days with friends and the children, and it will all go too quickly. Before we know it, we will back in the foothills below the snow-covered Sierra Nevada and discussing the architects plans for our home.